Apartmani Mare are set 1.5 km from the very centre of Split and the UNESCO-protected Diocletian’s Castle. They feature a free car parking spot, while the closest beach can be reached on foot in 10 minutes. Apartments are air-cooled and feature a seating area with a TV, a kitchenette fitted with kitchenware and a private toilet with a shower and toilet. The nearest dining establishment can be found 500 metres away, while a coffee bar bar and a grocery shop are just a couple of meters away from the apartments. Tennis courts can be reached in a 10-minute walk, while a sports centre is also available not far away. Split Old City presents innumerable galleries, shops, clubs and eating places. The Peristil Plaza is 1.5 kilometers away. The Marjan Hill presents numerous treking and biking possibilities and can be reached in 3 km. Main Bus and Train Stations and Ferry Port are all situated within 1.5 km. Boats to surrounding islands of Brač, Hvar, Šolta, Vis and Korčula leave daily from Split Marina. Split Flight terminal can be reached in 28 km. 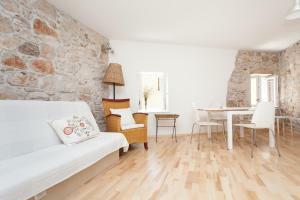 Studios Nina ~0,1 km, Split price per day from € 42 Please inform Studios Nina in advance of your expected arrival time. You can use the Special Requests box when booking, or contact the property directly with the contact details provided in your confirmation. Villa Mima ~0,1 km, Split price per day from € 70 Only 700 metres away from Split’s famous Bacvice Beach, Vacation home Mima is surrounded by cafés and eating places. 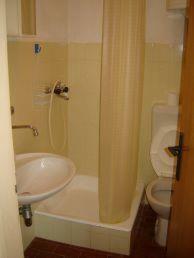 Rooms here have an en suite toilet and air conditioning. These rooms are sunny and most have a private balcony. Each room is equipped with a TV set and some also include a kitchenette. Towels and linen are included in the rate. The Diocletian's Castle is just 1 kilometers away from Mima Villa. The property also presents a back yard with grill amenities. Stobrec ( ~ 5.1 km ): 146+ apartments, 11+ villas, 6+ hotels. Kastel Sucurac ( ~ 5.3 km ): 31+ apartments. Solin ( ~ 5.7 km ): 13+ apartments. Kastel Gomilica ( ~ 6.6 km ): 39+ apartments, 10+ villas. Kastel Kambelovac ( ~ 7.6 km ): 29+ apartments. Zrnovnica ( ~ 8.2 km ): 9+ accommodation units. Beach Trstenik, Split ~ 1,1 km from Apartmani Mare Gravel beach: recommended for young people, with restaurant, with caffe bar, equipped with showers. Excellent choice of watersports. Beach Znjan, Split ~ 1,2 km from Apartmani Mare Gravel beach: ideal for families, recommended for young people, with restaurant, with caffe bar, equipped with showers. Excellent choice of watersports. Beach Bene, Split ~ 1,2 km from Apartmani Mare Gravel beach: ideal for families, recommended for young people, with restaurant, with caffe bar, equipped with showers. Excellent choice of watersports. Beach Zenta, Split ~ 1,2 km from Apartmani Mare Rocky beach: recommended for young people, with restaurant, with caffe bar. Excellent choice of watersports. Beach Kastelet, Split ~ 1,7 km from Apartmani Mare Gravel beach: ideal for families, recommended for young people, with restaurant, equipped with showers. Restaurant Adriatic Graso, Split Guest reviews: 8,1/10 ~ 2,7 km from Apartmani Mare Address: Uvala Baluni bb, 21000. Cuisine: Mediterranean cuisine. Restaurant Velo Misto, Split ~ 0,9 km from Apartmani Mare Address: Setaliste kalafata 2, 21000. Cuisine: Mediterranean cuisine, Croatian cuisine. Restaurant Bistro Topolino, Split ~ 1,6 km from Apartmani Mare Address: Obala K Domagoja BB, . Cuisine: Croatian cuisine. Restaurant Dvor, Split Guest reviews: 8,9/10 ~ 0,9 km from Apartmani Mare Address: Put Firula 14, 21000. Prices: 78 HRK - 336 HRK. Cuisine: Barbecue, Mediterranean cuisine, Seafood. Restaurant Caffe bar Tenis, Split ~ 0,9 km from Apartmani Mare Address: Put Firula 18, 21000.